The Turkish Mine Disaster: How Could It Happen? : The Two-Way The accident that has claimed hundreds of lives appears to have causes that are all too familiar to mining experts in the U.S. and around the world. The Turkish Mine Disaster: How Could It Happen? Miners rest Thursday during a break in the rescue operation after a mine explosion near Soma, Turkey. Turkish Prime Minister Recep Tayyip Erdogan has enraged families of the victims of the Soma mine disaster by characterizing mining accidents as "ordinary things." In fact, the disaster appears to have ordinary causes familiar to mining experts, who note that well-known precautions exist to prevent the kind of explosion that killed so many in Turkey. "The risk is constant," says Tom Hethmon, a professor of mine safety at the University of Utah and a consultant to mining companies around the globe. The risk "has to be managed," Hethmon adds. "And the margins of error are low." The first major risk apparent in the Soma mine is the concentration of workers underground. "That can happen either because the mine lacks mechanization and requires a fair amount of human labor," Hethmon says, "or it's a very large operation requiring a large number of people." Both appear to be true in the Soma mine according to miners there who have spoken with reporters. Hundreds worked underground and some sections of the mine didn't have mining machines, so more workers were needed for the digging. There's also the fact that the explosion rocked the mine during a change in shifts. If mining continues during shift changes, workers from both shifts are underground simultaneously. "It enhances productivity," says Davitt McAteer, a former federal mine safety chief who has investigated three major mine disasters in the United States. "But what it does is double the number of people that are at risk," he adds. "You ... increase the number of fatalities in one fell swoop." Reports from Turkey indicate the explosion originated in a power distribution center underground, which brings in electricity from the surface and sends it in cables throughout the mine. Every power center and cable, as well as all mining machines, vehicles and other equipment, are potential sources of ignition. Coal seams also contain explosive methane gas and coal dust, an accelerant that feeds explosions. So the world's coal mines, which supply 30 percent of global energy needs, are volatile places. Even so, the risk can be minimized with the right tools and practices. That includes power distribution centers, says McAteer. "They should be designed to encase an explosion," he says. "For about 100 years around the world, we've encased an explosion source [with] a metal box that keeps the explosion from entering the atmosphere of the mine." An ignition entering the atmosphere of the mine can trigger methane and coal dust explosions, which "propagate very quickly underground, and there really isn't any place to hide," says Hethmon. Survivors of a massive explosion may then be overcome by noxious gases, especially if escape routes are blocked. At the Turkish mine, the explosion cut power so elevators couldn't carry survivors to the surface. In the United States and elsewhere, mines are required to have alternate escape routes. "If that's not being done," McAteer says, "then that's a violation of very basic safety practices that have existed in this country and ... around the world." In the U.S. and many mining countries, regulations also require robust ventilation and other measures to control methane gas and coal dust. Government mine inspectors check for compliance and levy citations and fines for violations. In Turkey, however, the rules appear to be lax and the inspections relatively infrequent, according to McAteer, who cites reports that the Soma mine had only five inspections since 2012. "A mine of a similar size and conditions in the United States ... would end up with 40-plus inspections" in the same time frame, he says. "The failure to inspect on an ongoing basis means that complacency sets in and you don't have the kind of upkeep of your maintenance and upkeep of your safety precautions" to prevent accidents. Turkey has an average of 100 mine fatalities a year, according to the International Labor Organization. Coal mines in the U.S. had a record low 20 deaths in 2012 and again in 2013, according to the Mine Safety and Health Administration. China is the deadliest mining country with more than 1,000 fatalities annually. But major disasters continue to occur around the world despite tougher regulations and enforcement. 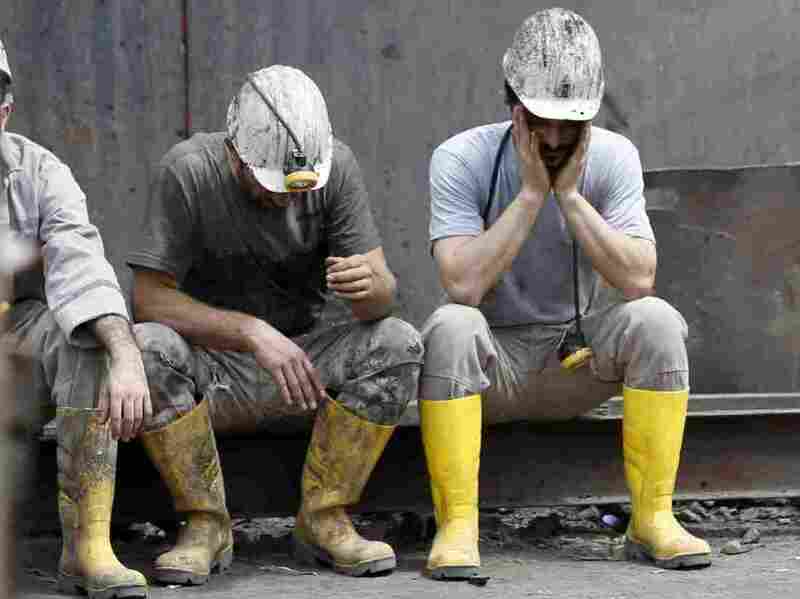 "We shouldn't spend too much time feeling superior to our brothers and sisters in Turkey," writes Ken Ward, a veteran mining industry reporter for The Charleston Gazette, in a blog post recounting weakness in mine safety regulation and enforcement in the U.S. In fact, just this week, two miners died in a Patriot coal mine in West Virginia, which had persistent serious safety violations, targeted enforcement, extra inspections and a rare designation as a mine with a "pattern of violations." The mine had more scrutiny than most coal mines, and portions of it were closed temporarily dozens of times due to threatening conditions. But federal regulators couldn't close the entire mine for good, as NPR reported yesterday. McAteer investigated the last major disaster in the U.S., which left 29 miners dead in 2010 in Massey Energy's Upper Big Branch mine in West Virginia. A common theme in accidents everywhere and in the last century, he says, is mining companies putting production before safety, and regulators unable or unwilling to stop them. "Tragically," McAteer says, "the similarities are profound."